MARK NANCE/Sun-Gazette A record 4,279 fans sit inside of Sojka Pavilion at Bucknell as the Bison wrestled No. 1-ranked Penn State on Friday night in Lewisburg. The home match for the Bison sold out Sojka Pavilion. Bill Graham stands 5-feet, 7 inches tall. When he wrestled at Bucknell in the early 1960s, he was a statue of a man at 6-foot-1, 205 pounds, with a 19-inch neck and 18 1/2-inch biceps. He walks around Sojka Pavilion now ever so gingerly. Years of back issues have taken their physical toll. But he’s never lost the spirit of a wrestler. Friday night as he sat in his matside seat, he moved with the wrestlers he watched. He’s never been able to get the wrestler out of his system. It’s apparent if you watch him take in a match of his beloved Bison. As the chairman and CEO of The Graham Company, one of the nation’s largest insurance brokerage firms, Graham’s donation to Bucknell helped reinstate wrestling to a varsity sport in 2004. When he travels to Lewisburg from his Gladwynne home, he moves from spot to spot shaking hand after hand on match day at Bucknell, just as he did Friday night. He was the reason more than 4,200 fans filled Sojka Pavilion to see Bucknell wrestle three-time defending national champion Penn State. When he donated the $5.6 million to help reinstate the varsity wrestling program, he told coach Dan Wirnsberger during a trip to Florida his goal was to someday see Sojka Pavilion sell out for a wrestling match. Wirnsberger delivered that goal to Graham last night. Even though Penn State dominated to the tune of a 42-3 victory, there was nothing which could wipe the smile from the faces of either man. 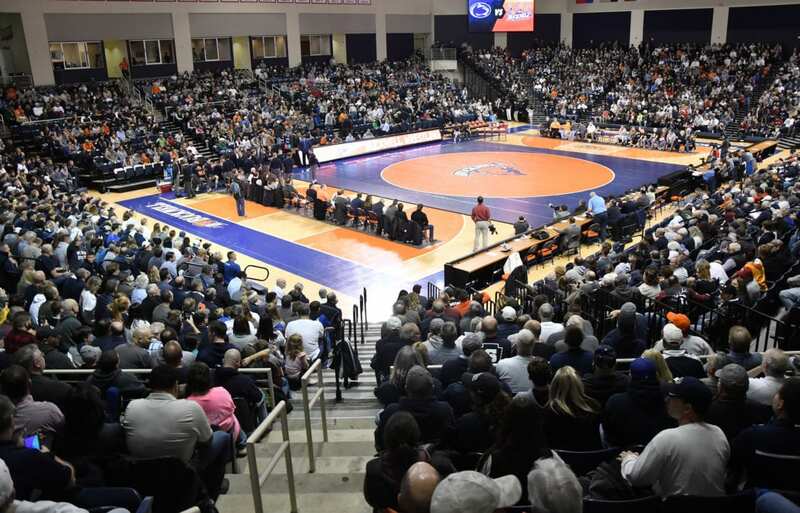 It may have taken longer than either of them expected, but Bucknell set a school wrestling attendance record and established the third-highest attendance total in Sojka Pavilion history with 4,279 fans. Regardless of the final score, Friday night was a win for Bucknell, for both Graham and Wirnsberger, and for the sport of wrestling in the Susquehanna Valley. There were no visions of grandeur regarding last night’s match. Wirnsberger knew what he and the young Bison were up against when they scheduled a two-year home-and-home series with the program which has become synonymous with NCAA wrestling and has captured seven of the last eight national championships. The hope was Bucknell could steal a match or two. They were able to do that when two-time NCAA champion Vincenzo Joseph didn’t travel for the dual and Bucknell’s D.J. Hollingshead was able to beat backup Bo Pipher with a late four-point move at 165 pounds. Wirnsberger knew it was going to be exactly the kind of hostile home environment it was. Roars from the fans during lineup introductions were much louder for NCAA champions Jason Nolf and Bo Nickal than even for local products Nick Stephani or Geo Barzona. At best, Bucknell fans made up about 20 percent of those in attendance. But they made themselves known. When Barzona funked through a Devin Schnupp shot and nearly scored a winning takedown at 125 pounds, they came to life. When true freshman Zach Hartman scored a takedown against two-time NCAA champion Nolf, the Bison faithful jumped to their feet and the Penn State fans quickly became quiet. When Hollingshead finished off Bucknell’s only win with a four-point move in a 5-5 bout, Sojka Pavilion erupted. Bucknell didn’t have to win last night for the event to be a success. It was a success because it happened. Penn State has visited other programs in recent seasons drawing sold out crowds to arenas where they don’t happen ever. Last year it was Binghamton. 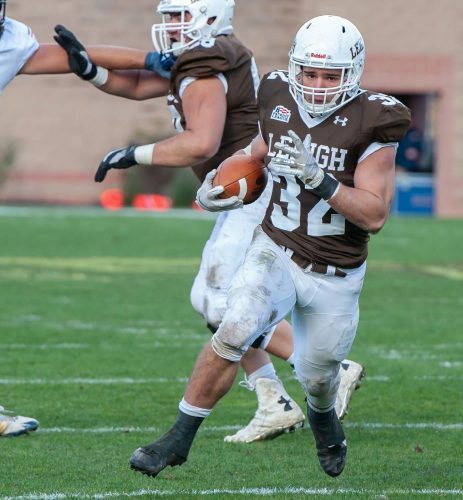 The year before Army West Point. And in 2015 they traveled to California to face CSU Bakersfield. As much as it’s about competition, it’s also about helping to grow the sport. And sold out arenas help grow the sport. Wirnsberger said a dozen or so people approached him to say they came out to last night’s match despite never having been to a wrestling match before. In the 14 years since the program’s reinstatement, Bucknell has already had multiple All-Americans and had the program ranked in the Top 25 in the country. Last night’s match was just the next step of the process. Graham, who has given multiple multi-million dollar donations to Bucknell, has said his next goal is to see the wrestling program reach the Top 20 in the country. His most recent donation to the school provided the funds for the Graham Building, which houses one of the best wrestling practice facilities in the country, which should potentially help build the program toward his next goal. Being competitive like that is in Graham’s nature. It’s part of what was instilled in him when he was the captain of the undefeated Bison wrestling team in the 1961-62 season. But for one night last night, the scoreboard didn’t matter. It will matter more when Graham makes his annual trip to the EIWA and NCAA tournaments in March. And you’ll be able to see how much it matters to him by watching him in his seat. He’ll be wrestling each of the matches with each member of the Bucknell wrestling team. The spirit of a wrestler lives in Bill Graham, and he’s allowed the spirit of wrestling to live at Bucknell. And Friday night in Sojka Pavilion, the spirit of wrestling shined. Mitch Rupert can be reached at 570-326-1551, ext. 3129, or by email at mrupert@sungazette.com. Follow him on Twitter at @Mitch_Rupert.